What’s Poppin’ Tonight! #FantasyWednesdays presents #SpringBreak Edition w/ MTV Conceited & Vixen Dayami Padron + Porsche Foxx at Dream Nightclub ~ Phresh Hott New! Tonight! The S/E Groupe presents Fantasy Wednesdays “The Only Place To Be On Wednesday Nights In Miami”! 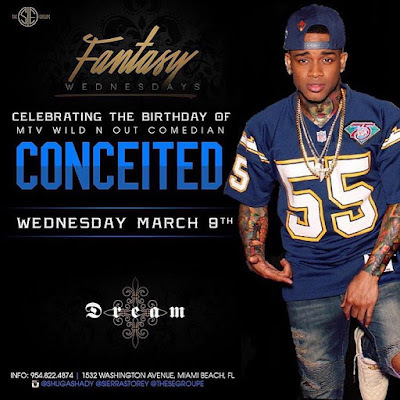 Fantasy Wednesdays presents Spring Break Edition featuring the Birthday of MTV Wild N Out Comedian Conceited hosted by Vixens Dayami Pardon + Porsche Foxx & South Beaches Sexiest Video Vixens at Dream Nightclub. Plus + More Fun! For VIP Bottle Service Please Contact 9548224874 Birthdays Packages Available Upon Request.